Cheese blintzes are comfort food in my family and at the same time a special treat. I think they are best homemade because commercially made blintzes are ruined by making the filling too sweet. According to my mouth, they should be just slightly sweet and served with something sweet and of course, sour cream. To make the blintz wrappers, beat together eggs, water, and, milk in a small bowl. In a medium bowl, mix dry ingredients and slowly beat in egg mixture until the batter is smooth. Allow batter to rest for at least a half hour. Heat a small skillet (about 7”) over medium heat and add a tablespoon of clarified butter. Pour about 1/4 cup of the batter into the pan and swirl it around, pouring off excess. Cook for about a minute, not letting it brown until the edges start to just curl. Do not flip them. Carefully remove them from the pan and layer them to cool. To make the filling, mix together farmers cheese, melted butter, egg yolk, vanilla and sugar in a medium bowl until incorporated. To assemble the blintzes, beat the egg white until frothy in a small bowl. Place a blintz wrapper on a plate and place a generous tablespoon of the filling at the top of the round. Brush the egg white around the remaining outer circle of the wrapper. I rolled the wrapper from top to cover the filling, then fold over the sides and roll again from the top until the blintz is formed. Place, seam side down, on a platter. 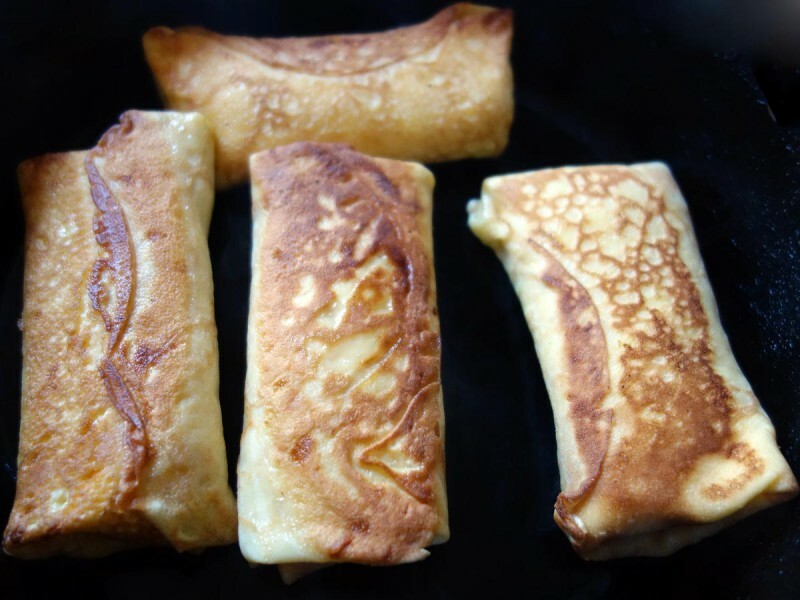 When you’ve wrapped all the blintzes, prepare to fry them. In a large skillet over medium heat, fry the blintzes in butter until they are golden brown about 2-3 minutes on both sides. Place in a 250 degree oven to keep them warm until they are ready to serve. At this point you can also cool them in the refrigerator or freeze them. To serve them from the refrigerator (defrost beforehand if applicable), bake them for 10 minutes until the blintzes puff and are heated through. Serve blintzes with sour cream or plain Greek yogurt and fresh fruit, fruit compote or fruit syrup. If you can’t find farmers cheese you can substitute small curd cottage cheese or ricotta cheese. Remember these are great made ahead of time and kept in the refrigerator or frozen.